Often we can feel paralyzed by fear or sadness when we are bombarded with unpleasant news reports. Living in a very informed technological world, we have to create our escapes and responses to these feelings when they are triggered or stirred up. When we can’t turn off the noise and retreat to quiet environments, we can find helpful ways to channel this energy more healthily. I find that the little moments in my day helping those I come into contact with gives me an empowering feeling. I may not be able to donate a large sum of money to those in need. I may not be able to instantly jump on a plane and give my presence to desperate situations. What I can do, however, is many small loving things every day. We forget that we each make a difference. We are the helpers to those in our environments. If you are in a store, you may spot someone struggling with something you could help them with. You can practice patience with a slow driver or co-worker. You may be able to buy a cup of coffee for someone short on money. You can practice kindness with how you interact with people in today’s digital world. We can be quick to jump to opinions and judgements when you aren’t looking them directly in the eye. Perhaps helping is sending someone loving thoughts or encouraging words. When you help uplift others, you help create a more uplifting world. You can donate small amounts of time or money to causes close to your heart. If you see litter, you can help pick it up. You can truly do things anywhere on the scale and still make a difference. Many times a small gesture in someone’s day makes things a little easier on them. Every helpful thing we can do contributes to collective energy. This fuels better circumstances. Sometimes I hear people lose interest in helping others because they don’t get a big reaction or recognition in that instant. At times it may take a little practice and patience to understand the process. When you show someone that isn’t used to kindness some love and kindness, they very well may not react the way you would like them to or think they should. I’m sure we all come across people from time to time that may not have had the pleasure of growing up in loving environments. They may not be projecting helpful examples. Does that mean you can’t be an example? We can be quick to correct someone rather than understand they have not experienced kindness and love. We can show kindness by planting a seed. A seed they can reflect on later. A seed that might inspire them to pass that goodness onto another. The same way understandings don’t always come to us in an instant, it may take someone some time to digest love and kindness. You don’t always have to understand someone to be kind and helpful. We can help by not only by doing helpful acts, but by teaching them as well. The way we treat ourselves and those we come into contact with can help inspire kind acts of change figuratively and literally. We don’t have to feel helpless when it comes down to it. We may not always have the power to respond to all the crises we hear about in news reports, but we can be powerful everyday. The more people that demonstrate love and kindness in their daily lives, the more help we spread to the world. We can do so much more when we help one another. The definition of help is to make something easier for someone or to do something by offering one’s services or resources. To give a helping hand, assist, or come to the aid of someone. So in any moment you are helping by contributing more positively and more lovingly. When we feel stressed or paralyzed, we can step back and ask “How can we contribute better: by fearing, or by helping?” Even if you can’t directly help a situation that you feel emotionally impacted by, you can send some loving thoughts and envision a better frequency. 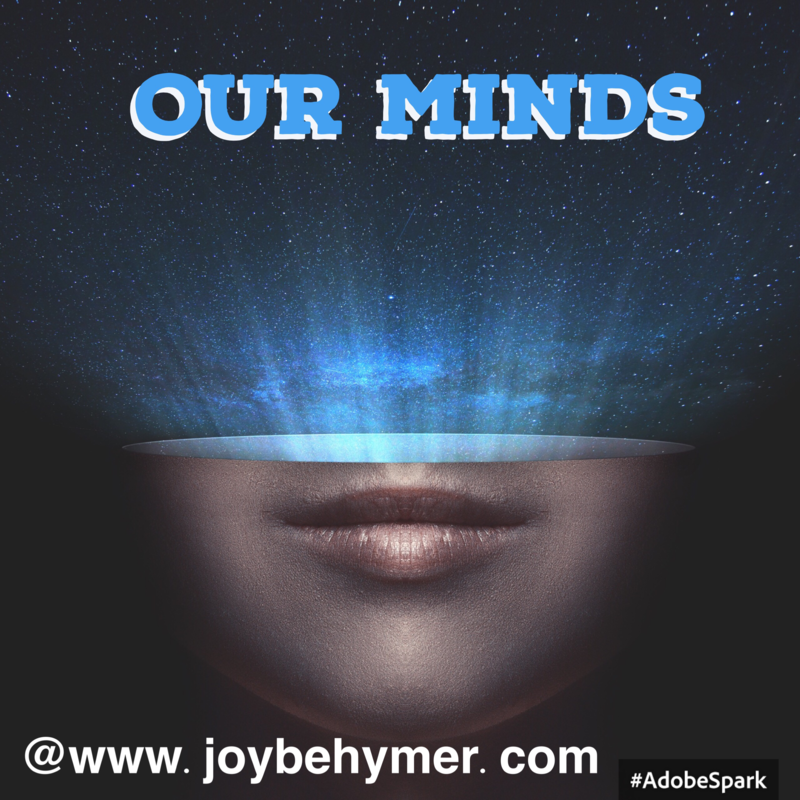 Our thoughts have power. Rather than getting triggered towards anger, we can practice more helpful thoughts. Even if it takes a little practice and isn’t our first instinct. We can notice and choose to practice more loving thoughts. 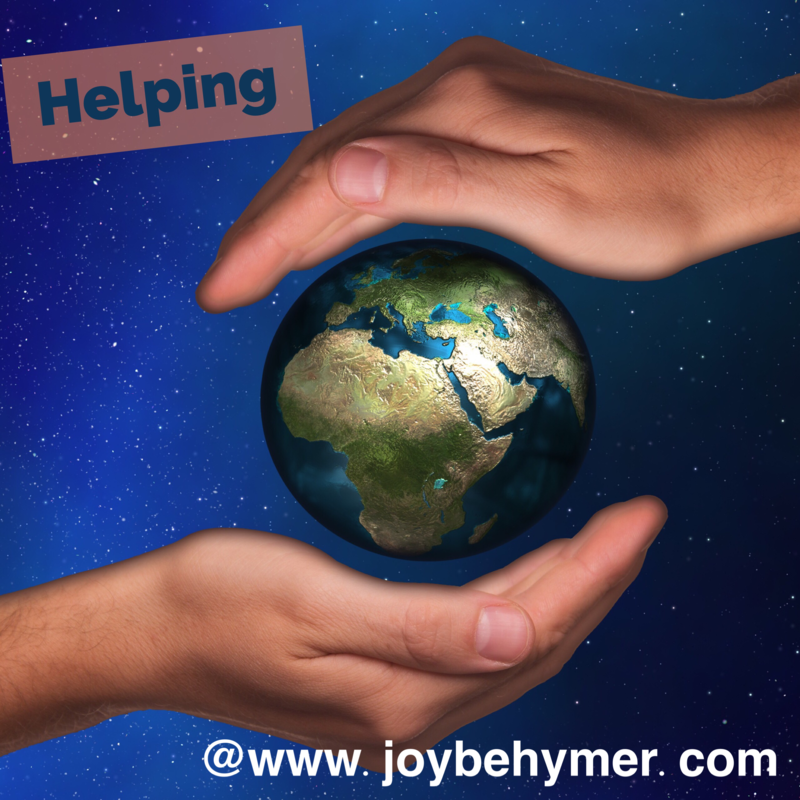 Regardless of what is going on in our world, we can consciously choose to be helpers. When you can help in big ways, it’s an even bigger yay! I want to remind you, though, that it’s not just the big things that make a difference. Big or small, help is always important. There’s an old saying that I have heard over the years, and it goes like this: “Minds are like parachutes. To work, they need to be open.” I have always tried to remind myself of this little tidbit over the years when I come across new information. We have been living in the Information Age for a while now and often find ourselves being introduced to new information. Although we frequently hear it said that “Knowledge is power,” it can also be overwhelming and tricky to decipher. The hardest part is knowing what needs our attention and what doesn’t, which is difficult when information is being forced upon us from all angles. It helps to prioritize and to know exactly what it is you’re looking for. It’s also important to exercise good judgement and critical thinking. When I research things, I find points from both sides of the coin and facts that support more than one side of every story. In my experience as a consumer of information, I’ve learned that the two most powerful strategies we have are keeping an open mind and trusting our intuition. When you come across facts that contradict themselves or find evidence that fits more than one puzzle, you really have to rely on what you resonate with. Just because information is something you haven’t heard before doesn’t mean it’s false. Often when we hear information that is beyond our education or experience, we tend to dismiss it and deny its existence. We don’t always allow space for things we haven’t learned or been exposed to. When we close our minds to new ideas we may miss very relevant or helpful information. The mind is such a powerful tool. We can use it to help us—or to shut out opportunities. There is much we simply do not know. It appears to be impossible to learn everything we need to in our culture and education. Especially with technology and science advancing so quickly. As things progress and advance, we learn things we didn’t know before and many times we prove the things we thought were true actually aren’t. So if you are stubborn with your facts, knowledge, and information, you may very well be misinforming yourself. Our brains are designed to download information into our subconscious. So it can be very difficult to learn and unlearn new things. 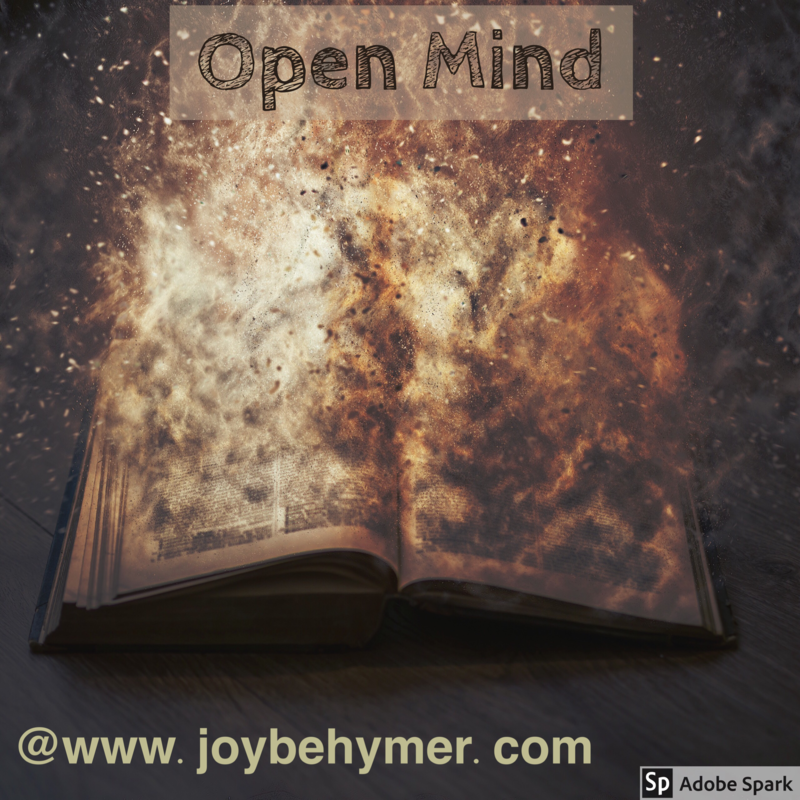 However, when you can keep an open mind when you come across information that changes or challenges what you know (before your first instinct kicks in to deny or argue against it), you allow room for more understanding. I find myself exposed to quite a bit of new information every day. It does challenge what I know so far in this game, but if I don’t approach it with an open mind, I miss out on newer and better things on the horizon. Not all new things are necessarily better for us, but without being open to weighing the options, we miss out altogether on ideas that may help us better our lives. I find often when browsing social media that it seems we are quick to argue with another rather than first fully listen. Then there may be an opportunity to learn or look further into it. Once we have given respectful attention to a subject that may be important for us, we can share our perspective and understanding. I feel if we can approach our conversations and interactions with an open mind, we can come to understand one another better. We may not always agree on every subject, but you can allow love and growth in. Sharing is caring. Just because you have been introduced to information you haven’t encountered before does not make it right or wrong. The first step is discovering a bit more. Perhaps the information is something you know very little about. Or maybe there have been better advancements and understandings since you’ve studied and learned it. It could even be a lack of experience from your own perspective. No matter the reason, it may be helpful to remember that none of us know it all. Since life is in constant motion and always changing, our information and technology will most likely change as well. I think it’s our human nature to be innovative and strive for better results and findings. For us to move forward and progress as well, the first step is opening our minds! Imagine you are sitting in front of a calm, peaceful stream. You are surrounded by nature and all its stunning beauty. The warmth of the sun shining down upon your face. The smell of fresh air penetrating your lungs. You can see the vibrant colors of the flowers and trees. No noise from traffic or the city. No phones ringing and buzzing. Just you and these tranquil surroundings. You pick up a rock and skip it across the river and watch the ripples multiply as it expands. Taking in this marvelous and peaceful flow. You can appreciate how one small rock creates this change in movement. The juxtaposition between stillness and flow. Imagine feeling peace, calm, and tranquility. How often do you feel harmony throughout your day? In our river of consciousness, our thoughts, feelings, and words are stones causing a ripple effect in our lives. We don’t always pay attention to the power of our stones we are tossing in. When we aren’t intentional with our thoughts, words, and deeds, we may have created negative habits that are rippling in an unpleasant direction. We notice them daily, but not how we may have contributed to that energy and momentum. Our thoughts, words, and actions are powerful stones. When we can slow down our busy thoughts, actions, and noise, we can experience the present like tossing the stone across the river in nature. We can be more intentional and mindful of our choices. 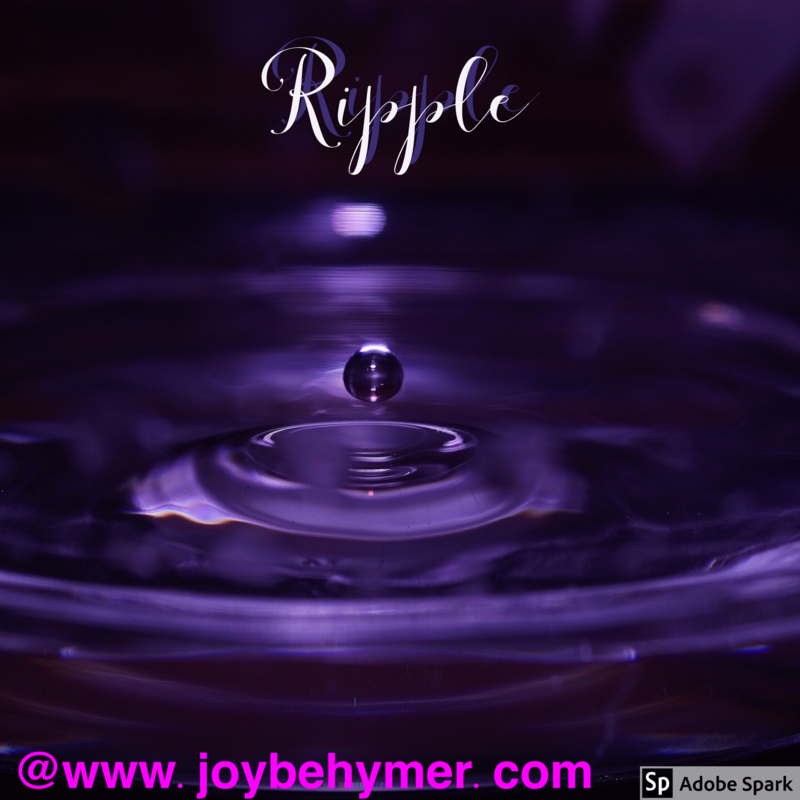 We can get caught up too often in our distractions of our busy lives missing our ripples. It can be very beneficial to find a few moments in your day to experience some quiet moments and stillness. A disconnect from the frequency waves of stress and worry. A moment to take a few deep breaths and connect with the river of stillness within. This small amount of time can help you aim towards more harmony to infuse in your daily life. We often wait until we have days off or a vacation before we immerse in what makes us feel tranquil. We don’t always have large windows everyday for what we may consider relaxing. We can steal moments to inject ripples of peace and joy into every day. Often it’s the small moments that make the big impacts when we create a little space for them. The simple act of finding a few quiet moments somewhere in your day can manifest a ripple effect to penetrate your louder, busier times. Intentionally incorporating some harmony can carry you through your day more joyfully. It can buy you some space to notice how you are using your thoughts, words, and actions and give you some tools to calm down the chaos in your life. In this space, you have the opportunity to choose what stones you want to ripple in your life. Gaining the clarity of what you choose to say along with directing your thinking more, you will directly affect the kind of experiences you prefer to have. The more you can choose your thoughts and words with awareness, the more you empower the captain in your life—which is YOU! We can give too much of our power away outside ourselves. We give it away to expectations of others. We give it away when we don’t tend to our emotions. And we certainly give it away when we allow too much noise from others and from social media that moves us away from our inner selves. I encourage you to empower your stones that ripple through your life. When you choose little stones of peace, calmness, happiness, and joy, you ripple those into greater amounts in your life. Those small ripples turn into large ones expanding into the world. Be mindful of your stones and ripples. We are all contributing individually and collectively. We are aren’t only navigating our lives, but we are planting seeds and painting our world together! 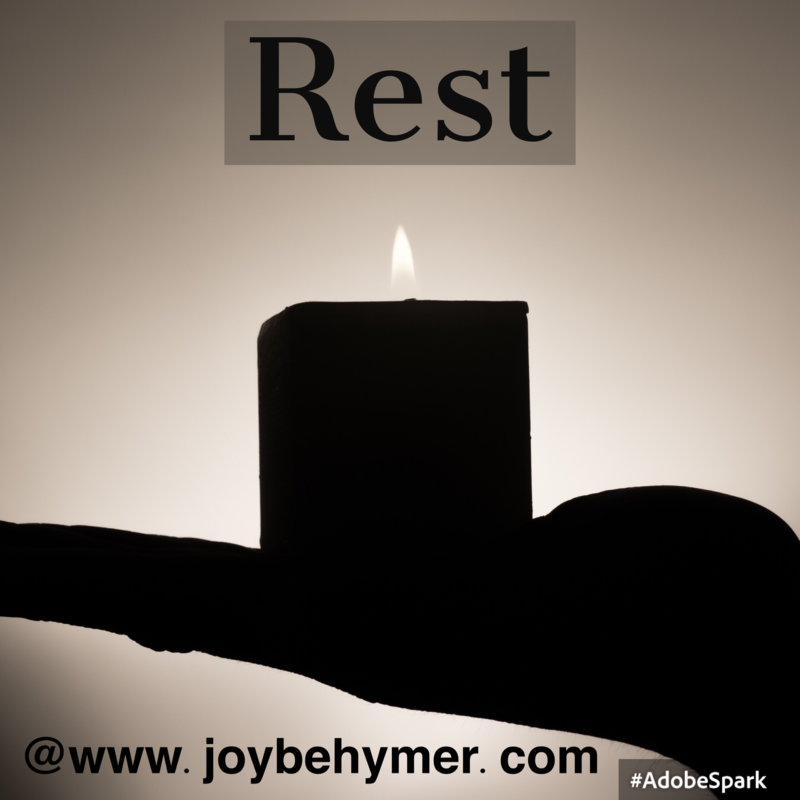 Too often I hear people refer to rest as if it’s only for the sick. Suggesting rest as a term of defeat or a 4-letter curse word. The importance of rest to enhance your stamina and perseverance is too often underrated, simply because many of us are taught to rest only when we are done rather than to rest along the way to fuel the momentum to our ends and goals. I’ve listened to many motivational teachers over the years, especially in business trainings and seminars. Sayings I’ve heard most often repeated are “You can rest when you’re dead,” “Hustle is 24/7,” and one that makes me giggle the most is “Suffer now or suffer later.” If the only path towards your dreams is suffering, no wonder so many people are terrified of failure and going after their dreams. Now I’m not against motavation. I just think we may have been hammering it a little too hard. I’ve found in reflecting on my successes that I’ve gotten where I am by being patient with my goals and hanging in there during the journey. The times I have tried the hustle approach, I have either run out of steam or crashed and burned. It took me a much longer time to get back up than if I would have learned better rest and balance along the way. Every time I tried to push my way to to my goals, I was ignoring the signals coming from my body, mind, and spirit. A few times my health even crashed to a scary place from too much hustle and grind. The message I would like you to consider is taking care of your body, health, and mind to help you rise to your successes and goals. We have many successes and failures in life. At least if one grind doesn’t work out, you didn’t pay for it with your health and sanity. Every grind doesn’t pay off the way we may have planned. You can recoup and keep moving better when you have rest and balance added to your journey. If you fail or fall, it’s a bit easier to get up rather than experience much suffering and defeat. Here is an example. Let’s say you want to drive a long distance trip to an exciting destination. Before you arrive, you are most likely going to stop for gas, stretch your legs, and maybe get some sleep. If you try to drive straight through the trip with no rest or refueling, you certainly can increase your chances of danger. Studies have shown if you drive long hours without sleep, you deprive yourself of your mental clarity, possibly causing a wreck or falling asleep at the wheel. Also, how far will your transportation go without the fuel? Just like pushing your vehicle too far and breaking down, you can push your body and health to the point of breaking down. I’ve learned when I incorporate more rest and balance in my life and activities, I engage with much better clarity and momentum. I last in the long hauls better. Valuing my own reserves for fueling helps me set the boundaries I need to succeed to the end. I see so many people running out of steam trying to push through the expectations. Rather than including rest and restoration, they burn their adrenals, causing stress, high blood pressure, and many negative health effects. Once this has taken place for a period of time, coming back from negative health can be a harder journey, often causing even more major problems. As another old saying goes, “All work and no play makes Jack a dull boy.” It may be better phrased as “All work and no play makes Jack a tired, sick boy.” I think the larger message is that there seems to be a time and place for everything. Balance can keep you from tipping your scales towards negative consequences. Even athletes understand the power of nutrition and balance to reach their heights. Work should be no different. Perhaps a good reminder to keep you moving forward with greater balance is to think to yourself, The harder I work, the harder I need to rest— and the less you have to try to force yourself to do things your body and mind are simultaneously resisting. Learn to listen to your internal navigation system. It is designed to help you. Allow rest to launch you to better heights. Be an ally to yourself, not an enemy. We all run into problems from time to time. From small daily things to big unexpected events. The choice we have is in how we deal with our problems. Usually our first instinct to problems is resistance. It is something happening that we didn’t want or plan for. 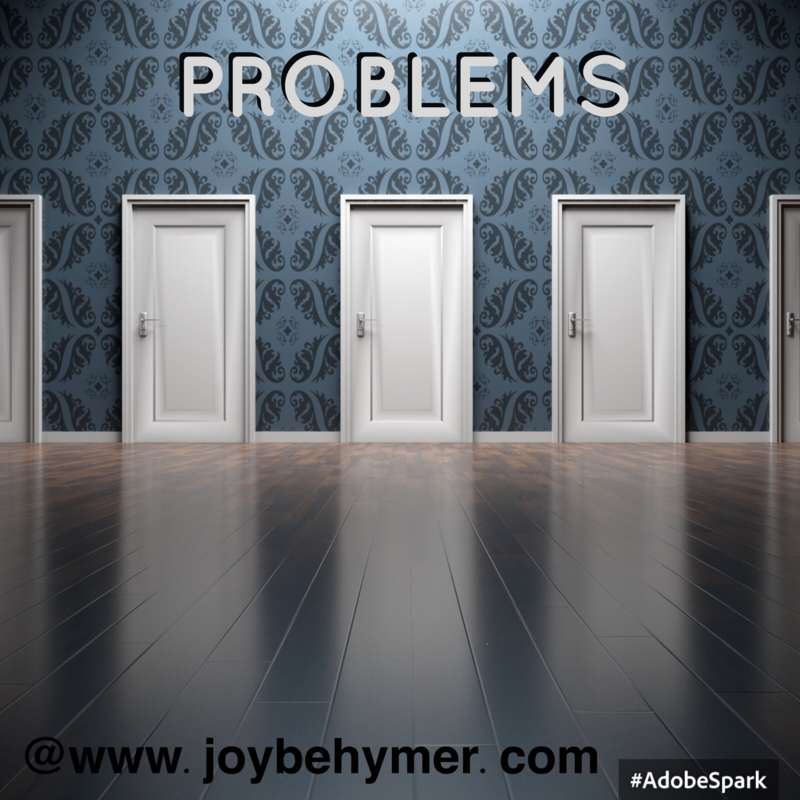 Often we fall into poor habits of thinking when we encounter problems. Rather than focusing on solutions and opportunities, we may have created a habit of worrying and overanalyzing. We spend too much time focusing on the problems, and that habit creates more problems. We aren’t always taught to step back and look for the opportunities in the change or situation. We may have created our first instinct to think of worst-case scenarios and agonize over what could happen or go wrong. When we tune into these thoughts and vibrations, we are actually attracting more negative outcomes with our stress and worry. Think of it like a domino effect. Once you knock the first one down, the rest follow after. Or there is an old saying that “birds of a feather flock together.” Your thoughts react very similarly. It’s like a chain effect. Once you are thinking positively or negatively, the next thought generally follows suit. Now, you can turn negative worrisome thoughts around, but it may take a little practice and trickery to turn that momentum around. You may have to start slow to look for the positives in the situation. If you slow the focus down on the problem or the negativity, you can allow some space for other thoughts and feelings to come in. You may have to look for the silver lining. If you can find any good points to start with, you can turn the worry and troubling thoughts around by focusing on one good thought at a time. If you can get a few going, you can start the domino effect going in your favor. It’s done by training your mind and subconscious to start looking at things more positively. When you can look for the positive points more often, you will create those habits of thinking. You don’t have to jump to stress and worry when a problem arises. The more you can practice, the stronger your abilities get. No one can promise you that situations and problems won’t pop up, but you can learn new and better ways to cope and deal with them. Isn’t it nice to know that you can experience problems without things getting worse? It’s more about the forces you choose to add to your momentum of thinking. Learning to see the positive aspects instead of seeing everything that can go wrong can be a more empowering way to use your imagination. Utilize your gifts of thought in your favor. When you understand how powerful your thoughts really are, you can move them around in support of you. Your mind generally leads you in one direction or another. The opposite of problems is assistance, help, benefit, peace, opening, or a good situation. The opposite of worry is calmness, cheer, certainty, pleasure, trust and reassurance. So you always have an option in which direction you are leading your thoughts. You can guide them towards more worrisome and problematic thoughts, or you can practice more regularly the more calm and reassuring thoughts. I have found that I deal with my problems so much better and more clearly when I can take a little time to feel reassured. I have to build that trust and guidance from within. 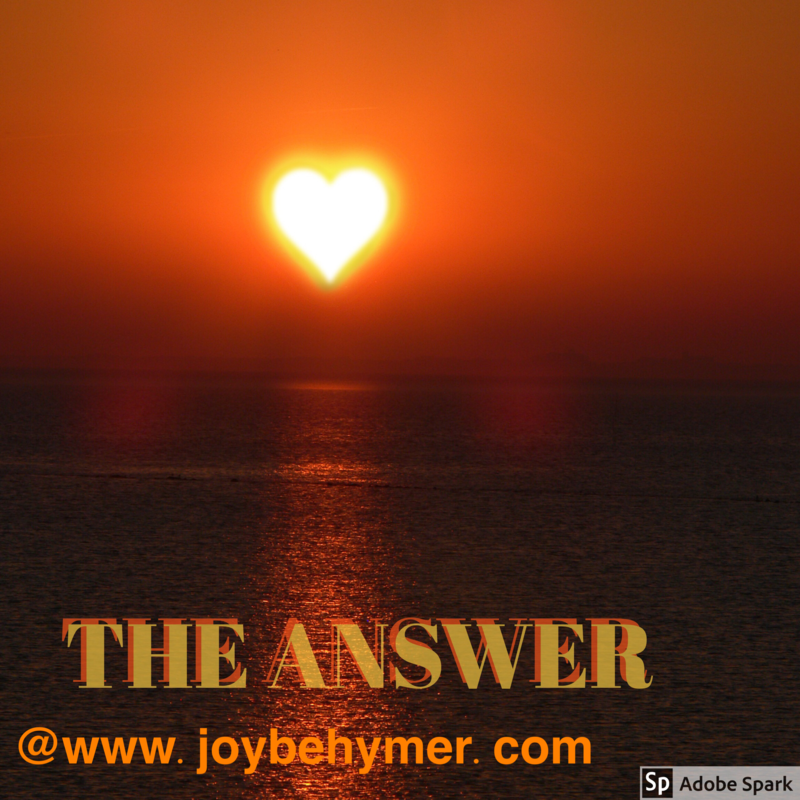 Often the answers we need are within ourselves. When we burden ourselves with the problems and worry, we can’t see a better solution awaiting. The next time you start to notice and experience a problem, acknowledge your feelings and emotions surrounding it. See if you can find some positive things to focus on until you feel more centered and comforted. Once you can gain this perspective, you can allow more solutions in these opportunities. You may even surprise yourself and find a better direction. Many times problems that pop up are a blessing towards a better journey than we had originally planned. 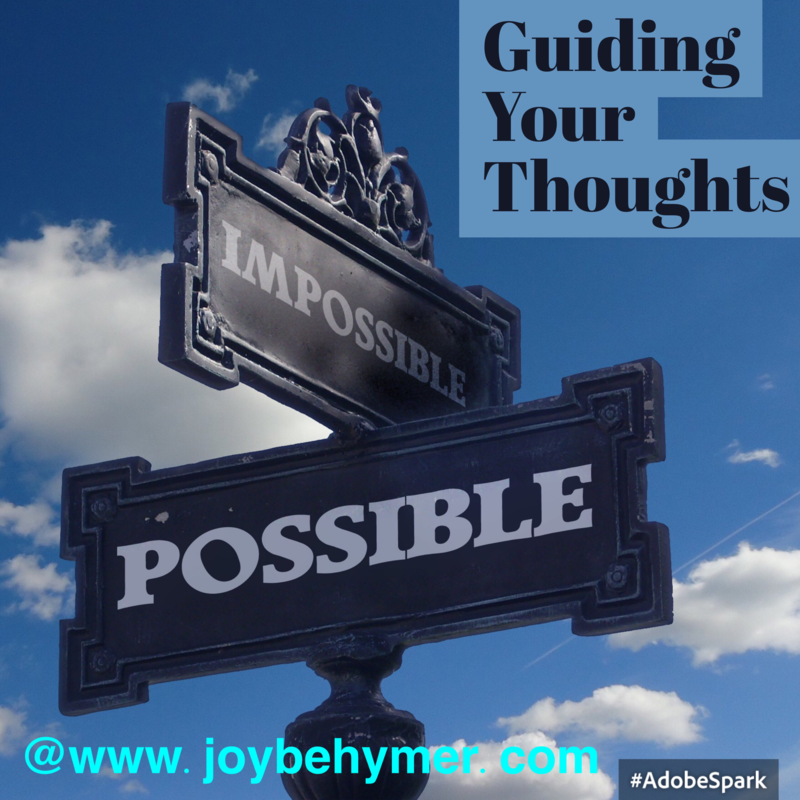 I’ve learned over the years that guiding your thoughts yields better results than trying to control them. Often when we have decided to aim to feel more positive by working on our thoughts, we tend to make it harder on ourselves by trying to force it. Many people teach in meditation that, rather than trying to stop all thoughts, we should learn to observe them and allow them to pass by. The same concept can be helpful in our everyday lives. Many of us are living in a fast-paced, busy culture. Finding ways to destress and not feel overwhelmed can take some practice in how we experience our present. When you want to feel joyful and relaxed in your daily life, it is helpful to know that it’s not about trying to control every thought—it’s about learning to guide your thoughts. You do that by noticing how you are thinking more often. The awareness of how you are feeling when things are busy is key. We often push through and do not pay attention when life is busy and stressful. We get through it by triggering our adrenaline. Our adrenaline is designed to kick in for emergency situations. When we get our adrenaline going daily by being stressed, our health and kidneys can be poorly affected. We often get caught up in our busy world and forget to notice how little we are breathing deeply, feeling relaxed and balancing this pace. Even noticing many times in your day how you are feeling and breathing can be a small step into remembering to take deep breaths and feel calm. Paying attention to the little moments in your day can provide a powerful yet small opportunity that is doable. For many, big changes are hard to do all at once. Instead of struggling to rise to overwhelming expectations, scale it back to some smaller steps. Think of it like eating your meal with smaller bites and slowing down. The idea is to pay attention throughout your day to notice when you are feeling those stressful and unpleasant feelings, and then to gently guide them towards more pleasing thoughts. If our situations in life don’t provide much opportunity to feel calm, we have to find ways that are applicable in our lives to feel calm. Noticing when we are feeling stress and when our breathing gets shallow, we can take a second to take a deep breath and decide to think about something pleasing. Just for a moment. It doesn’t take much time or money to stop and think about either a pleasant memory, something you’re looking forward to, or something you’d enjoy. This immediately slows down your heart rate, allows more space to breathe deeply, and evokes some calmer emotions. Once you feel a bit more calm, you can move through your day and handle more details with a bit more ease. It amazes me at how much better my decision making process is when I’m not feeling stressed. When I make decisions from a calmer place, I also feel more at peace after making them. You can feel more sure-footed. As you feel more ease through your day, you will in turn feel less stressed, less overwhelmed, and certainly less negative. This leads to better health and more positive feelings. Guiding moves with more ease. Controlling is more forceful. Can you feel the difference between the two? It’s just a small adjustment towards feeling more joyful daily. The more joy you can harness more often, the happier your daily life will be. It amazes me how powerful small shifts can be. Perhaps it’s because they are easier and more applicable. Change can be more permanent when it’s comfortable and simple. We often give technology more credit than we do the capabilities of our magical minds. Just like a computer downloads and stores information, so does our mind—but we have much more than a hard drive. Our mind may take us a few years to store science and advanced studies, but it may only take a second to download the information that you can burn yourself touching a hot surface. We are multifaceted in many ways. It can take a computer programmer a period of time to download information, but we can’t teach a computer the powers we have like creativity, innovation, imagination, ideas, and visualizing. We forget how magnificently and capably we are made. The abilities and possibilities of what we can do are endless. We continue to evolve, expand, and grow. Not only each of us, but collectively as a whole. We often get lost in our everyday tasks, focusing on our activities,, our responsibilities, and too often our problems. We forget the power we have in what we do with our minds. Where we focus our thoughts, emotions, ideas, and capabilities. You were born with ingenuity. Creativity. Conjuring ideas and possibilities. Have you ever paid attention, when things are down to the wire, to the miracles you have performed in your life? I think when we can stop and take notice of things we didn’t think were possible turned into reality, we can let go of some of those strongholds of disbelief. You don’t have to have everything figured out to believe in what is possible. If that were the case, we certainly wouldn’t be on the internet or using smartphones. It seems with our technological advancements we are just now understanding more of what the brain is capable of and how the mind functions.. We are learning that consciousness can’t quite be measured and that awareness exists outside of the brain. We are truly opening up to more ways we can work with our beautiful and creative minds. It seems amazing to me that, in addition to our talents and gifts, we may be competent at even more! When we take the time to nourish and care for our thoughts and mind, we also enhance our abilities. We often forget how inventive and resourceful we are made to be. Our genius is within us all. Don’t discredit yourself for not knowing it all. No computer does, and man has to download it to begin with. The more you can appreciate and recognize your greatness, the more you empower what is possible! Our minds are one of the greatest values and assets we have to help with our health, body, and soul. The more we can treasure and respect it, the more knowledge we can gain and the higher we can soar together. Be open to learning new things. Understand there is always more to know. The less we close our minds, the more possibilities we open ourselves up to. The more we open ourselves up to the possible, the less we limit our potential. I encourage you to be open and keep unlocking your potential. The sky is not the limit. Only your mind is. You don’t have to keep it locked up or grounded. You just have to first believe. I used to have a bad habit of saying we all have our limits. Now I understand that I am the only one who sets those limits. To set any boundaries restricts what we can do. Take off your constraints and allow your mind to keep expanding. You may be pleasantly surprised at how far you can go! In life we can be frequently faced with stress. Whether big or small, often it is a big nuisance in our lives. In my career, stress appears to be one of the biggest complaints and struggles people deal with. I’ve not met anyone who has been able to completely avoid experiencing stress. With practice we can certainly learn how to manage stress and improve our reactions to it. When we stress over our stress, we create an even bigger mess than the one we are already faced with. Not only does stress create much strife, but it also affects our health more than we may realize. When we don’t find ways to balance the stress in our lives, it often manifests in health problems and unhappiness. When we take the approach to fight stress head on, we end up creating more stress for ourselves. It isn’t always possible to eliminate stress from our lives, as circumstances can be out of our control. We can, however, accept that when it arises we can practice better management. We can think of stress as an alarm system. Rather than struggling so much with it, we can look at it as an advantage of communication from our inner self. When stress arises we can understand that our body, mind, and spirit are letting us know something is out of our alignment. It could be simply that we need to step back and reevaluate our situation. Slowing down to look at things a little more closely can be therapeutic when dealing with stress. When we can give ourselves the space to calm down and center ourselves, we can find clarity in handling our stress. It can also allow us the time to shift our perspective away from feeling stressed. We can have stress without panicking or making our stress bigger by the way we perceive it. Many times we stress because we don’t know the outcome. We create bigger unease and stress by imagining worst-case scenarios. Overthinking can escalate quickly, causing us to stress further. Making some peace with stress enables us to work through it better. Accepting how things are can enable more choices in how we deal with our stresses. 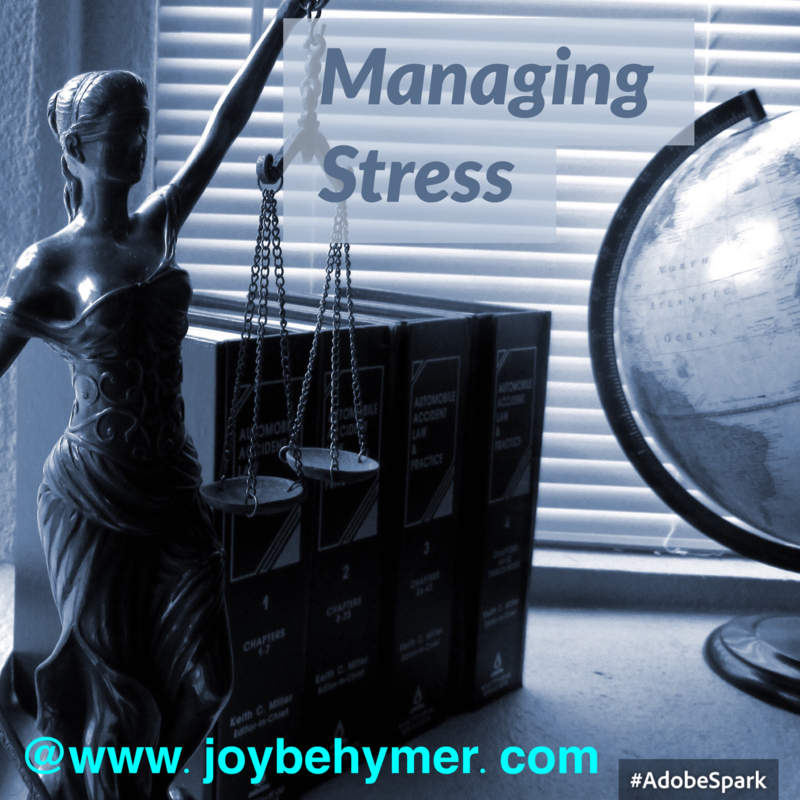 Stress can be a healthy communitunicator in our lives rather than an exhausting battle. When you feel stressed try to step back a little and ask yourself what the stress is trying to communicate with you. You can acknowledge stress as an alarm system, warning you to listen to your body and what it’s trying to tell you. Maybe you’ve said yes to what you really are miserable doing. Or you need to rest and take better care of yourself. Just because your mind wants to continue pushing you forward without taking a break doesn’t mean it’s good for your body or health. We may not be taught to listen to what our bodies are communicating, but we can learn from it if we do. I’ve seen people get severely ill too many times because they didn’t listen to their alarms. I’ve also learned a few of those lessons the hard way. They aren’t easy lessons when we ignore those nudges. Reevaluating how we spend our time and energy can help reveal where our stresses can be coming from. Take some time to see what is really necessary. Sometimes it simply comes from our hold on how we think things need to be. When we can let go of our expectations, we can release a lot of our stress. When we can honor what we need for our health by setting boundaries for self-care, we can heal many of the effects of stress. It’s helpful to take some time or give ourselves a little space to understand what we need more or less of in our life. Habits can be tricky to break, but if we can notice when we make the statement we feel or are experiencing stress, we can start by pondering what is off-balance. Rather than use the word “stress,” change the language to “off-balance.” When something is off-balance, we can look at ways to try to balance it out. The word “stress” in and of itself seems to amplify powerlessness. It’s like an escape to avoid looking deeper into what is really going on inside ourselves. You’re probably not going to eliminate all your stress in one day. What you can do is practice more things that calm and center you to manage the stresses in your life. Managing isn’t always about eliminating. It’s mostly about guiding, controlling, and directing. Stress can overwhelm us and bring us all to our knees at times. We can empower ourselves away from the stress mentality and towards more balance in our lives. Stress is screaming for the need to neutralize. We all de-stress differently. The key point is honoring the importance of some equalization. This is how we can live and manage with stress present in our lives. One common emotion we may battle is frustration. Frustration leads to tension and stress. Once we feel stressed it can take a little longer to come back from that feeling. But if we can catch ourselves as soon as we get frustrated, we can work with our triggers and reactions more readily. Before we escalate to that level of frustration and stress, we can take a moment when we first feel that tension and frustration building to take a few deep breaths. We can stop and ask ourselves if we can let go a little bit of our expectations in that moment or situation. Often I’ve noticed that when I can just walk away from the situation, either it ends up resolving itself or I am able to see it a little differently. Giving ourselves a little space between what is frustrating us and our reactions can give us time to calm down. That mini-break can create an opportunity to understand whether or not what we are getting frustrated about really is a big deal. It’s like the popular saying don’t sweat the small stuff. Many times we make a bigger deal out of things than needs to be made. Especially if they’re causing us stress and anger. There are times that we can do little about big frustrating circumstances. All we have control over is how it makes us feel. When we can’t control things we tend to become frustrated. Other times we just want things to get done fast and done the way we want them. If we can let go of how things unfold, we can allow more peace and understanding into our perspective. Or simply create a calmer, clearer state of mind to deal with what is going on. Frustrations like hurrying and worrying are habits we create. Often those build, and frustration becomes our initial reaction when things don’t go our way. Being aware of when we get frustrated can show us how often we are reacting that way. The more we can recognize this reaction, the more we can start retraining the mind to have more pleasant reactions. A little helpful hint to keep in mind when we are dealing with our frustrations is that often we want the issue to be resolved fast. Remembering that things can take time to work out for the better outcome can help you loosen your grip on being frustrated. If things go too fast, they may not work properly and we may end up with a bigger disaster on our hands. I’ve often found myself feeling frustrated with technology. Although I use technology frequently, it isn’t always my strong suit. I’ve had to learn much patience to keep my stress levels and frustration down. When I’m experiencing glitches I have learned the best thing I can do in that moment is to walk away and spend my energy doing something else. I may choose another task to work productively at, or I may just need to take a short break. Once I spend some time away from what I am frustrated with, either I find I can deal with it better because I have gained a calmer state of mind, or it miraculously works itself out. It takes me longer and probably wastes more energy to try to figure out what the problem was than it does to accept I simply needed some space between the issue and my frustration. 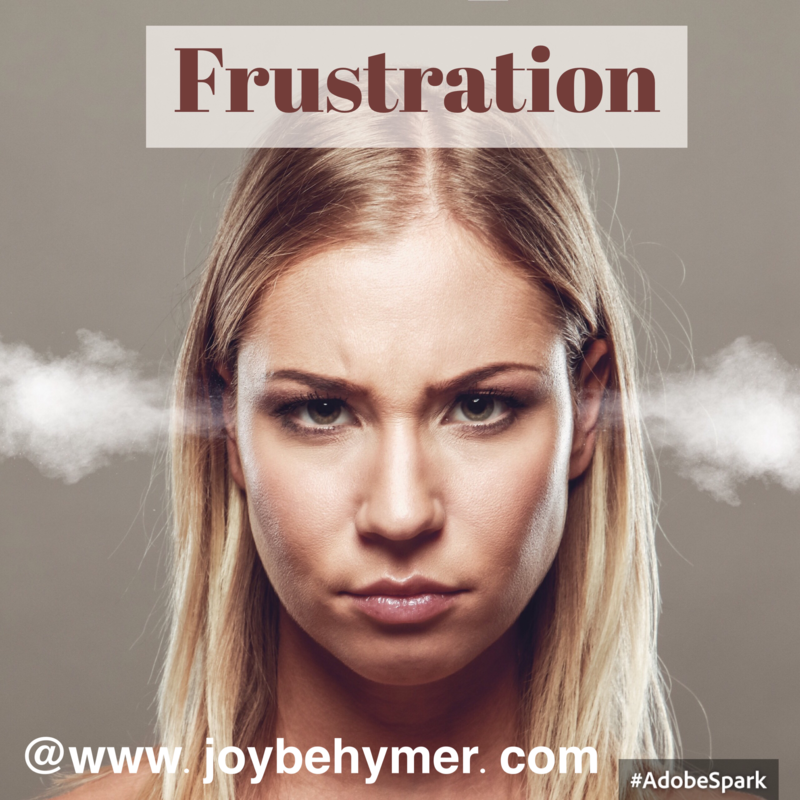 Frustration is like anger and other negative emotions that may feel hard or tricky to deal with. As we practice our reactions and awareness more, we can catch our frustration earlier and balance it with more positive emotions. It certainly can lessen our stressors and the way our frustration makes us feel!